This prime 13 sequence is repeated twice in our 24 x 24 x 3 inch diffuser. Diffusion over 3 octaves! 1125 Hz ~ 12,000 Hz. Modular. Designed to be used in groups. Can be fastened to wall surfaces, ceilings, or used with legs as free standing units. Perfect fit in drop ceilings. 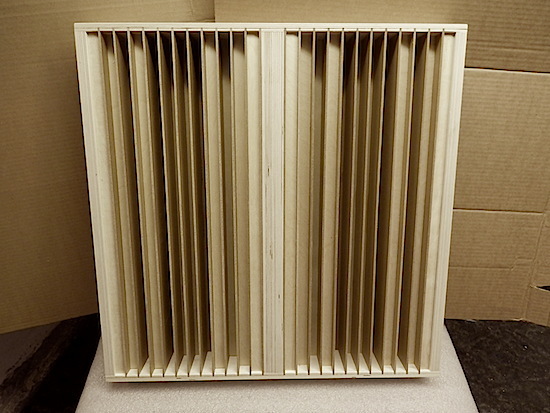 These units are made from solid wood and are available assembled or in a kit form (as shown above). You can finish these by either painting them, or in some cases covering them with speaker cloth. To treat an area no less than two units are recommended. For this reason they are only sold in pairs. Using an array 3 units wide and between 2 and 3 units high will nicely treat the rear wall where the most direct energy can be diffused. This will reduce the severity of reflections that hit your other three walls. Another example of effective use of a minimum number of units is on either side wall directly across from the listening position. It's a good place to start. You can add more in the direction of your loudspeakers. Usually an array of 2 units in width and between 2 and 3 units in height are ideal for side wall applications. If you're primary concern is depth of sound stage, then probably the best place to start is the front wall behind your speakers. Reflections from all other walls eventually hit this critical spot and then pass by your ears a second time, - something you want to prevent if at all possible. This is considered and excellent set up. The effects of treating all four locations is cumulative. Reflections get diffused over and over. This arrangement uses a total of 9 units on the front wall, 6 on the rear wall and 4 on each side wall. These units can be rotated. Using them vertically as shown in the middle of this array, will diffuse sound into a horizontal pattern. This is most effective on the center of walls where the reflections come from other walls. Rotating them for horizontal use will diffuse sound into a vertical pattern. This is most effective near floors or ceilings. The sample at the left shows a typical array one would use for complete floor to ceiling treatment. In free-standing applications you can experiment with a variety of placements. Handy if you don't have lots of units or the wall space. 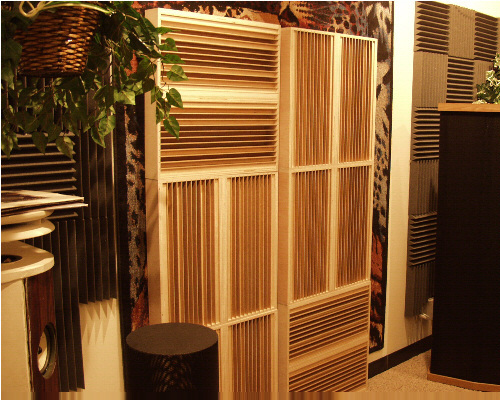 Whenever arrays are free-standing, we recommend gluing the 12 inch acoustic foam tiles to the back. This turns the back into a pure absorber. You can experiment with flipping the units around to hear and understand the differences between absorbing vs. diffusing sound. See high res. image here. 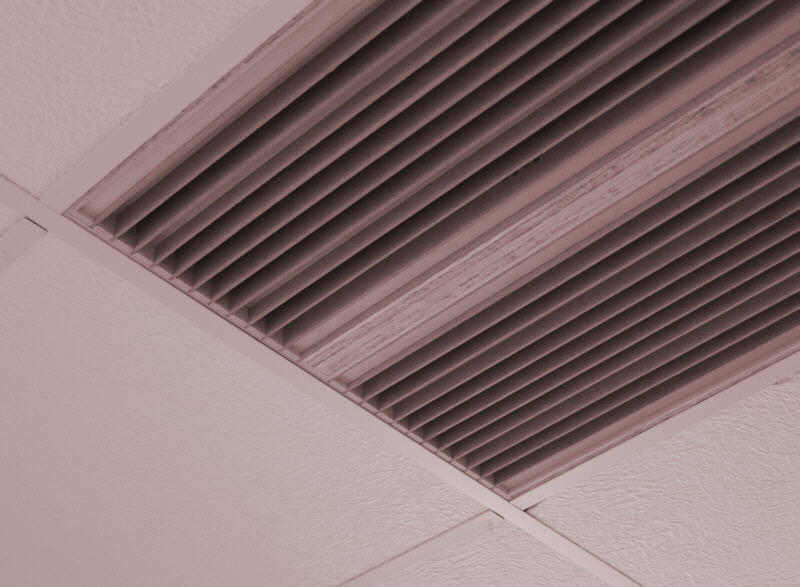 If you're in a basement listening room with a low ceiling, or any room that uses a suspended ceiling, you can make dramatic improvements by using these in patterns across your ceiling by simply placing them into the suspended ceiling grid instead of ceiling tiles. The P1324 Diffuser is available both in KIT form and fully assembled. They are sold in pairs. 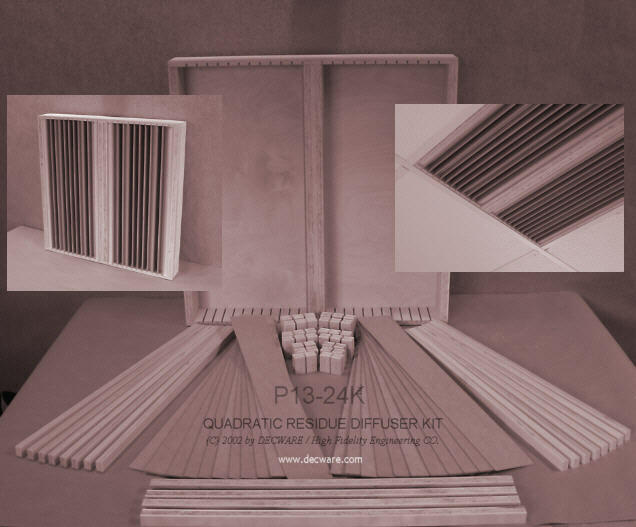 A pair is two 24x24x3.5 inch units. just hit one of the add to cart buttons below. Single 24 x 24 inch panel shown. Sold in pairs. Note, these units are sold and shipped in pairs. Shipping weight is 48 lbs per package.